I was on the phone with a friend of mine from college this morning. Our sorority house is being demolished this weekend in order to make room for a larger and fancier house on campus. I don’t know the history of the house and how long it has stood – I should know, but my days of pledgeship are over, so just take my word that it is old. My friend mentioned that I will probably be the only sister not there this weekend, which makes me sad. Sad, because I know the reason I am saying no is because I’m having to make very tough choices these days in order to manage how stretched thin I am. I am sad because I know that I am missing out on yet another event with friends who were once a priority of mine. Sad. Sad. Sad. I miss them. And I miss that part of my life. Motherhood is hard. Ok, you are thinking this is going to be a complaint post. No, not a complaint post. More like a PSA for all of you mothers that are living day-to-day right now. So I get to my point. 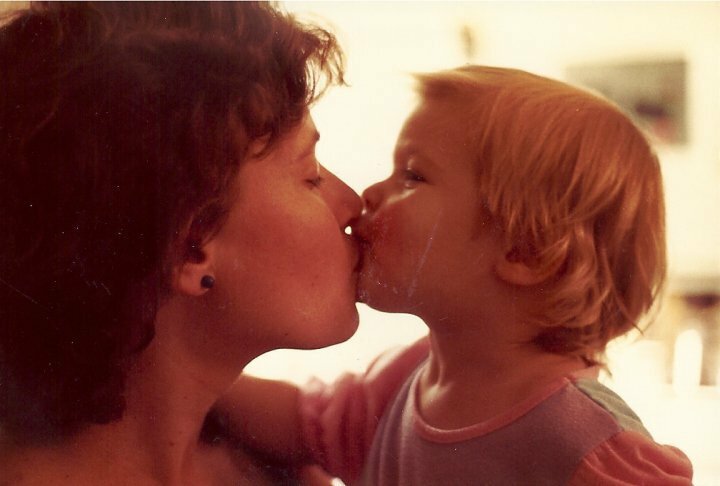 A friend of mine from high school has co-created an initiative called the #mothermanifesto. 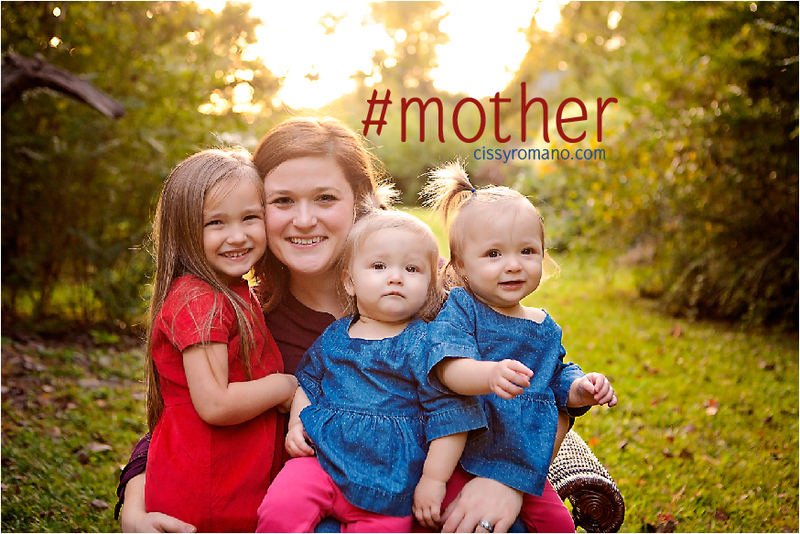 She charges all women from all walks of life to band together in support of being a #mother. While I know that a simple pledge is not going to be life-altering or grant me more sleep at night, I do find encouragement in a band of sisters lifting each other up in support. Sometimes, you just need to reinforcement that you are not alone. There are other #mothers out there who have to flake out on their college buddies for important events. Because, you know, you have kids. And no babysitter to be found. And you are renovating your kitchen. And those weekend hours are spent at the library picking up site-word books for your kid that is starting school in the fall. Or making Costco runs and freezer meals for the upcoming week. So, here I am – very transparent. Letting you know that I am riding this ride with you sweet mother. I feel your struggle and I know the way your brain is rationalizing decisions. I signed the manifesto because I want others to feel my digital embrace and to know that they are not along. If you feel the need to encourage, you can sign the manifesto here, and order the cool #mother shirt here. So, it’s been a little over two months since the lightbulb went off. That is about 10 weeks of increased sanity, increased time, and increased love of my home. I’ve tackled several areas of my home thus far, but my happiest is our toy collection. It is my belief that no matter if you have one or 10 children, you loathe toys. Am I right? They are everywhere. No matter if you are diligent about picking up said toys, they seems to appear in every spot besides the spots that you designated: sock drawers, your bag for work, the fridge… I was ready to declutter this part of our lives. R.E.A.D.Y. I should set the stage. We have a very small home compared the American average. Please don’t ask me the square footage, because I have never been able to understand why we talk in square footage when it comes to homes. But, either way, trust me – it’s pretty compact for a family of five. I love that it is small. Small house payment. Small surface area to clean. We are on top of each other – and I like for my family to always be in my line of sight or within an earshot. – sorry for the tangent – OK, so our toys lived in every part of our house: the kids rooms, our rooms, the bathrooms, the kitchen, the dining room, the living room, the den, and even outside! Seriously. Every room. I decided I was going to confine the toys to three areas: my oldest daughter’s room, the twins’ room and our den. Then, I used the KonMari method and dumped everything into the floor of my den and started sorting. I found the easiest to get rid of where all the miscellaneous piecy kind of toys that had missing parts or were bound to have missing parts in the near future. DONE. The hardest to get rid of were books. We have been given so many beautiful children’s books over the years that I found the memories of people giving them to us made it difficult to part with them. I then resorted to a max number of books allowed and reminded myself of our fantastic library and the experiences we have had going to the library to pick books out. D ONE. I purchased a clear box with a handle similar to this for a small collection of toys for the twins room. I also left a toy castle in their room between their cribs. Because my oldest daughter is at the age that she is able to play by herself, we allowed a few more toy options for her room. She houses all of the children’s books in the house as well as most of the stuffed animals. The stuffed animals now live in a pop up tent/castle that does an excellent job at concealing the large collection of stuffed animals that she was not able to part with. She also had a small(er) collection of Barbie and Barbie accessories in her room. All toys are now contained in similar clear boxes in her storage unit from target. The third place that houses toys is in our den. We have another cube storage unit that we store the following in: music toys, puzzles, blocks, plastic toy animals, and dress up accessories. We also have a basket with our balls and then a small kids table for the girls to sit at and play. The toy kitchen and kitchen accessories are also down there. Our arts and crafts are housed in a small fabric box on top of our tv and the games are right next to it in a plastic storage bin. So, we no longer have toys in our line of sight no matter where we walk in our home. It takes me – MAYBE – 15 minutes to pick up the worst tornado that is possible. Yes, 15 minutes. I have control back. My kids are starting to play in concentrated areas instead of at my feet while I cook. I am happy. My husband is happy. And my kids hardly miss the HUGE AMOUNT that we donated to the Salvation Army. If you are struggling to find a place to start in your home – try the toys. Everyone is happy to see those go! 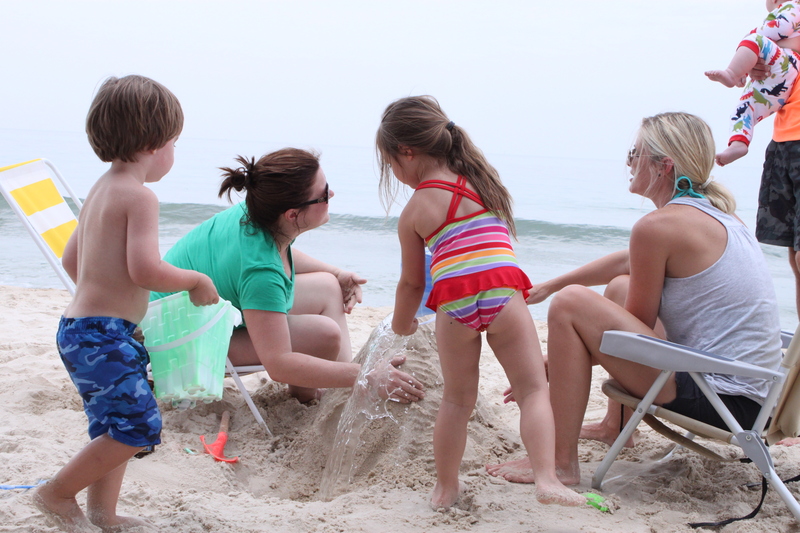 Yes, a beach trip with babies and toddlers is completely doable. When my parents approached me a year ago about my thoughts on “spending a week at the beach” next summer, my only response (in thought of course) was “Are you flipping crazy?”. 1. I only get ONE PAID WEEK of vacation a year – and you want me to spend it all at one time? 2. Three kids ages 4 and under? 4. A FULL WEEK? What will happen to my desk at work? It will take me 3 weeks to recover! Ok. Ok. Once the automatic “No.” was decided upon, my husband sat me down and made me think about it. How often will we get the opportunity to spend the week at the beach? AND paid for? So… we decided to go. And because it was not last minute (nothing with my family is unplanned), we had the chance to prepare the Dave Ramsey way. We saved a little each week for a year so that we wouldn’t have to worry about spending money while we were down there. We are notorious for believing we are millionaires while on vacation. So, my point here is to show those scared mothers and fathers that a beach trip is totally doable. AND, with proper planning, it should not break your piggy bank either. Plan to cook your meals at the beach. 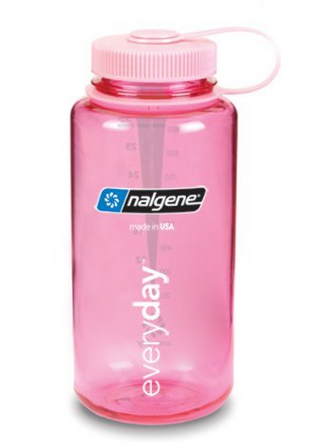 Not only is this a piggy bank saver, but a trip saver. We turned into so-called “beachbums” that week. We woke up bright and early for those inspiring sunrises (and because we usually had a kid screaming), ate our breakfast, then headed to the beach. We did not leave the sand until it was time to head in for supper. Cooking our meals allowed us to savor each moment in the beach breeze. Don’t stay at a place with a pool. I was downright frightened about this lack of amenity. 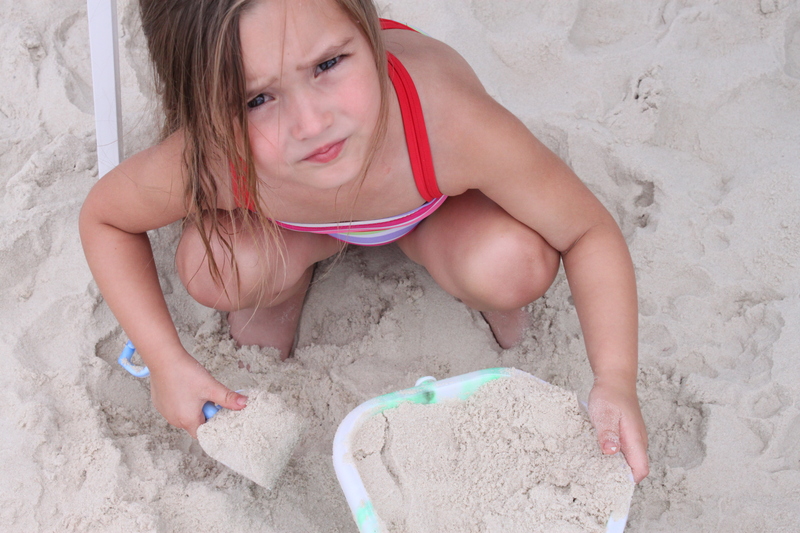 Our daughter has been on sand before (not during the summer) but we had never spent anytime at the beach in our 4-year parenthood journey. 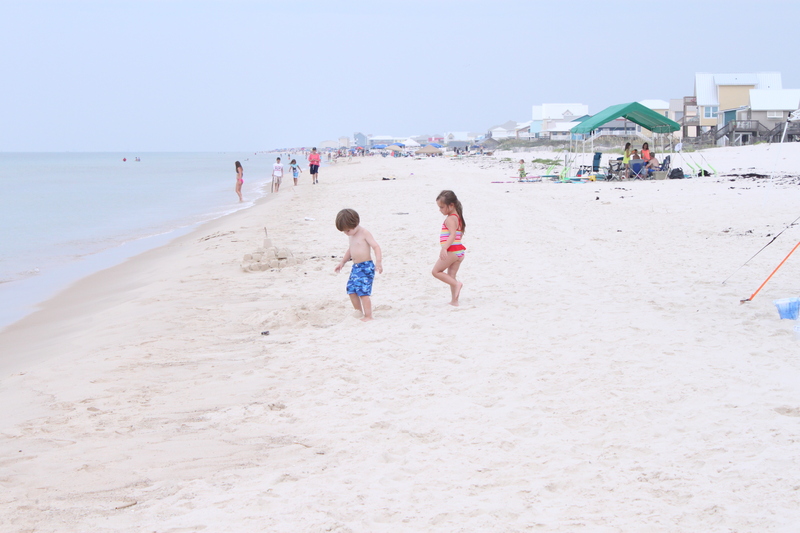 I have always heard horror stories about kids hating the sand / afraid of the ocean / stung by a jellyfish… what was I going to do with three young kids at the beach for an entire week if they hated the ocean and sand? So – my answer to this is to not give them the option to hate it! 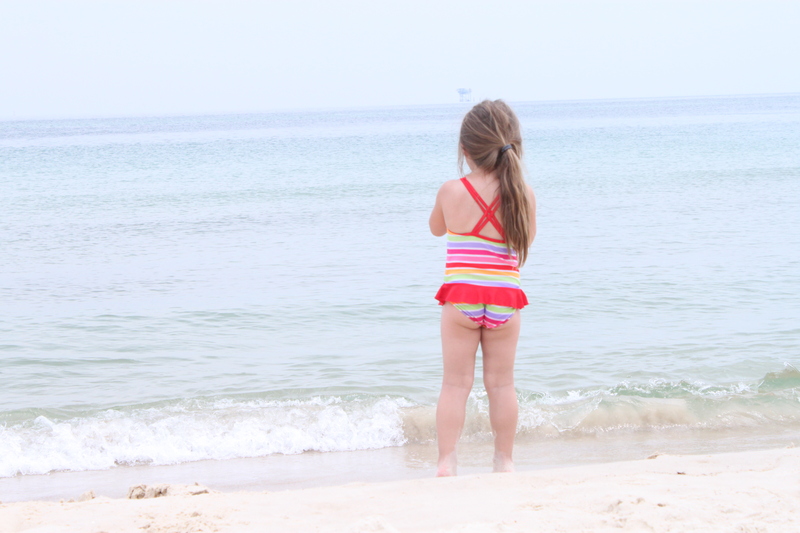 My oldest now looks like she is of a south-of-the-border ethnicity (I guess she already is a 1/4 Italian though) and could be a certified beachbum for the rest of her life. 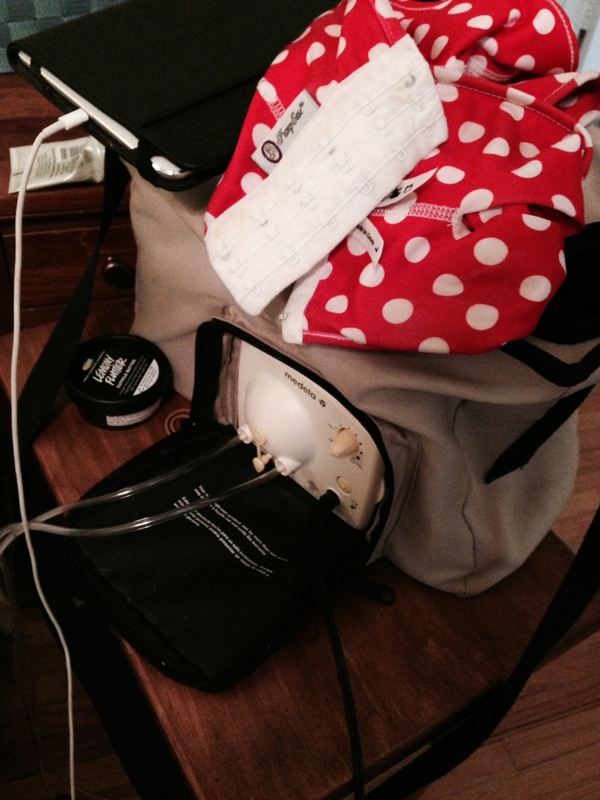 Don’t overpack. Wow – you should have seen our van. I am now regretting not having a photo to hang in my house to remind me never to overpack again! Because I didn’t realize my family would turn into beachbums, we had enough clothing and toiletries to last us at least a month in our normal lives in Birmingham. If we were not in swimsuits, we were in swimsuits with coverups. The fancy outfits I brought to clothe my children in for the quintessential beach photo opps remained in our Vera Bradley bags for the entire week. I only remembered I packed them when I was repacking everyone on the last day. Geez. I can be very silly sometimes. I guess the saying down at the beach is true, “No shoes. No shirt. 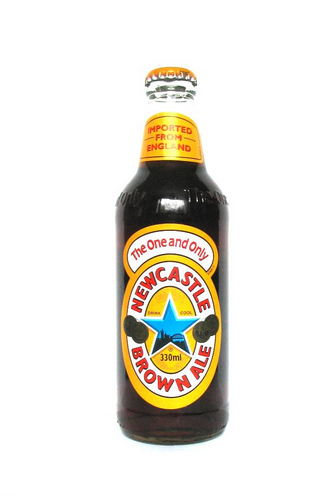 No problem.”.In that same vein – you don’t need $100 worth of toys and beach accessories to keep the kids happy. My four-year-old literally spent an entire day sitting on the edge of the water while scooping and pouring sand over her legs. 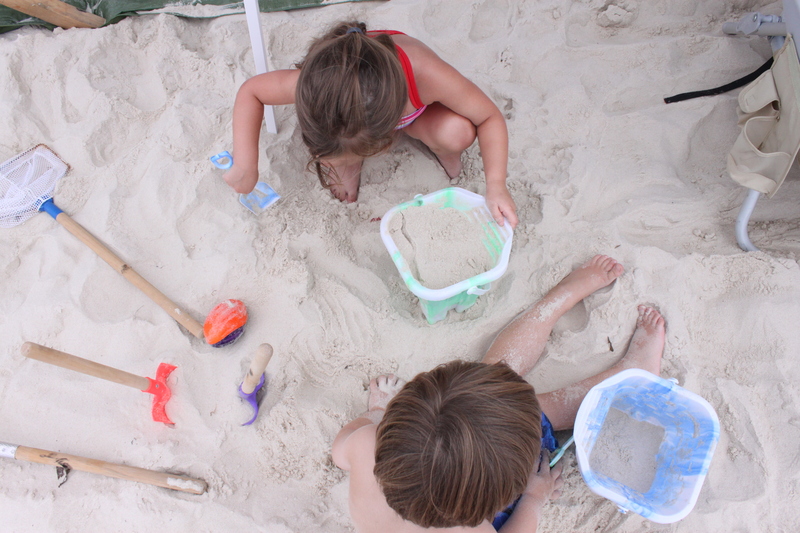 The buckets and nets and frisbees and kites and sand tools all remained under our ez up with the adults and babes. Don’t overplan. I know. I know. I just finished saying how important “proper planning” was… What I mean here is that you don’t have to have a slue of activities planned to occupy your crew. I mean, it costs a small fortune to head to the coast anyway. Jet-skiing, parasailing, deep sea fishing, etc. will not make the trip any better if you are hopping from one activity to another. My best takeaway from our trip is that my brain went to Jell-O for 7 days. Thank you Jesus for such a great blessing! Swimsuits not required! haha… no, I am not an aspiring nudist. 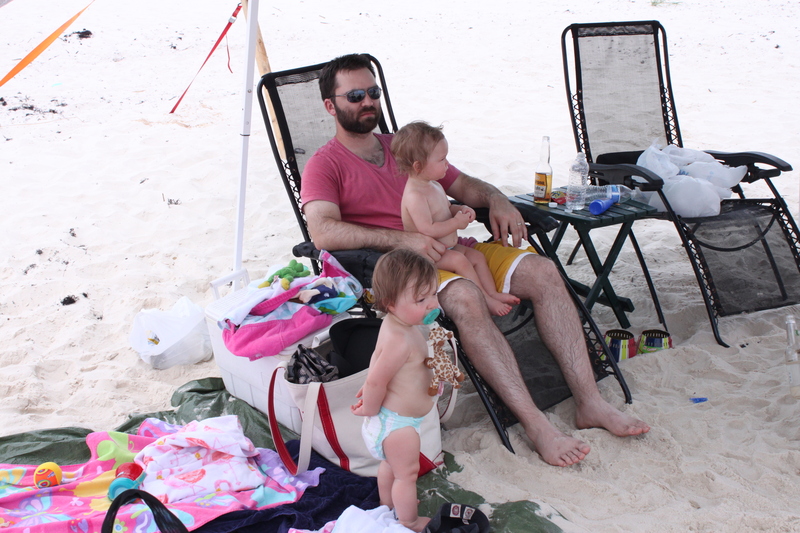 BUT, my babies – the real babies (14 months) – did not, I repeat, did not need the 5 sets of swimsuits I bought and brought with me for this trip. They also did not, I repeat, did not need the swim diapers. 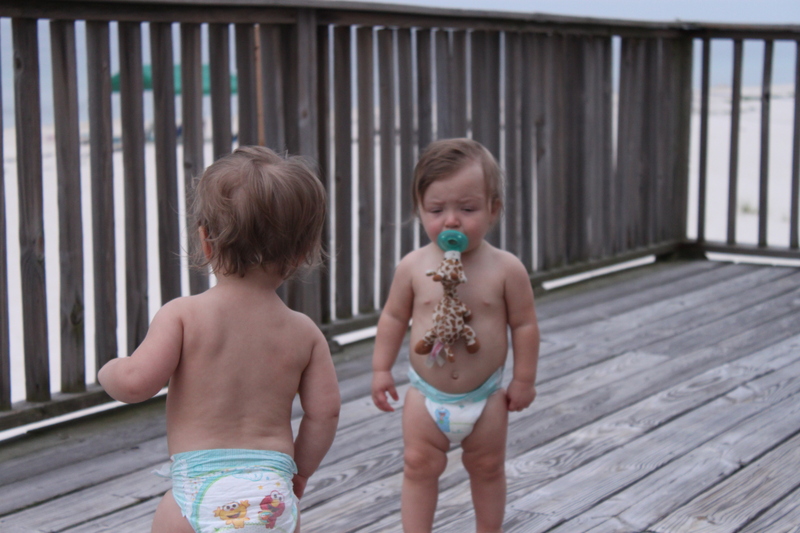 They wore regular old Pampers for the duration of the trip. I did put them in a t-shirt at bedtime, but they were semi-nudist for a week. And they loved it. And the pictures are adorable because of it. So, if you are on the fence about a beach vacation with your youngin’s, I am here to witness that a parent can survive and make memories. Best of luck to all of you parents, grandparents and guardians out there. Summer of 2015: I am looking at you with eyes wide open. You better be ready for the Romano crew!